How much juice should kids be drinking? Kids’ diets can benefit from consuming 100 percent juice, but parents should moderate kids’ juice intake to ensure an overall well-balanced diet. Here’s how to know whether your kid is drinking a healthy amount of juice. Parents should limit their children’s juice consumption. Children ages 1 to 6 should drink no more than 4 to 6 ounces of juice per day. Older kids ages 7 to 18 should drink no more than 8 to 12 ounces of juice each day, according to the American Academy of Pediatrics (AAP). If you have an infant, don’t introduce juice until she is at least 6 months old, and only allow her to drink it from a cup. Juice does not replace or match the benefits of consuming whole fruits and veggies. Fruit juice lacks the fiber contained in whole fruits and veggies, and too much juice can result in diarrhea, overnutrition, undernutrition or tooth decay. When giving your child the occasional glass of juice, make sure its 100 percent fruit juice and not a “fruit drink.” “Meal Makeover Mom” Janice Newell Bissex, M.S., R.D., points out that 100 percent fruit juices contain phytonutrients, or plant-based compounds that have disease-fighting properties and that aren’t found in nutritionally-lacking fruit drinks. Not only does excess juice consumption introduce unnecessary calories and sugars into a growing child’s diet, but drinking a disproportionate amount of juice may lead to lowered consumption of other healthy liquids like water. 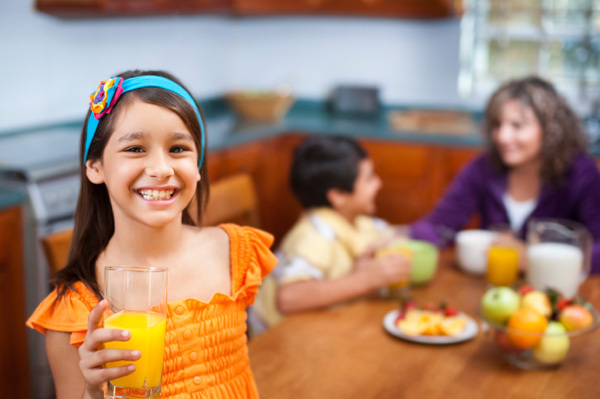 The AAP estimates that kids ages 1 to 5 currently consume at least twice the recommended amount of juice each day. If your child is used to sipping juice throughout the day or at every meal, it may be a challenge to wean him off the sweet stuff. Kathleen DesMaisons, author of Little Sugar Addicts, recommends starting by mixing juice with water — one part water to three parts juice. After two weeks, dilute more. Remember, you’re the parent, and you choose which foods and drinks your kids consume. If your child chooses not to drink what he is served, allow him to refuse — but don’t let him demand juice instead. Allow your kids to choose when they have their daily serving of juice, but make sure they don’t drink it after they’ve brushed their teeth for the night. Also, don’t offer kids juice as “entertainment” when they’re bored. Help your family beat flu season with a focus on juice, fruits, nuts and whole veggies. Aim to eat five to nine fruit and vegetable servings daily, and make at least one serving high in vitamin C.